Data loss is a nightmare for Samsung users. Commonly, data lose by accident due to human error. Since you can not foresee when the unexpected thing will happen to you, you had better backup your Samsung phone at daily time frequently. This article will introduce three Samsung backup apps for you. These apps can backup Samsung to cloud and external disks, and the software mentioned in Part 2 can backup Samsung to computer. No matter you like to backup Samsung to cloud, external memory or computer, you can choose one as you need. Part 3. Quick Comparison: Which Is The Best One for Samsung Backup? In this part, we recommend three mainstream Samsung backup apps - Samsung Cloud, Smart Switch and Google Drive. Actually, these backup apps can also serve as data transfer tools. If you want to know other Android backup apps or Android transfer apps, you can click the links. 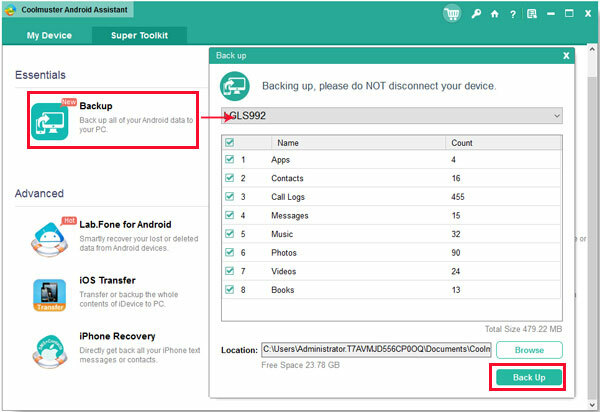 Samsung Cloud is an in-built Samsung backup app which is located on Settings menu. It offers 15 GB free cloud storage for users to backup and restore their Samsung devices quickly. You can move files to another device that is sharing the same Samsung account. If you turn on auto backup feature, it will auto backup your Samsung to cloud once every 24 hours. Contacts, call logs, SMS, MMS, music, calendar, gallery, APK files, app data, app settings and so on. Samsung Cloud supports many kinds of files, but you are not allowed to upload over 1GB files at a time. Please go to Settings > Cloud and accounts > Samsung Cloud > Back up my data > tick the items you want to back up > BACK UP NOW. The data will be backed up to Samsung cloud. Note: Access to Samsung Cloud and the availability of features may vary depending on device, OS, and country. Samsung Smart Switch is a Samsung backup app for users to transfer files easily. Especially when switching to a new Samsung Galaxy, Smart Switch is a useful assistant to help move files from old phone to a new one. But when the receiving device is not Samsung, this app may not work perfectly. The program supports contacts, schedules, memos, messages, call logs, photos, videos, alarms, bookmarks and more. With Smart Switch, you can backup these Samsung files to PC using its PC version. And the mobile app allows you to to backup Samsung data to Micro SD card/ USB memory. Backing up files to SD card and USB disk is not as safe as uploading data to cloud. Because your Samsung phone (with SD card) and the USB disk may get lost. However, it is a way to copy vital files and release some internal storage space of your phone. You can have a try if needed. Please go to Settings > Cloud and accounts > Smart Switch > More (the three dots button) > External storage transfer > BACK UP > select the content > tap on BACK UP again. Google Drive is a very famous app with 15 GB free storage for Android users to keep the uploaded files safely. This Samsung backup app supports multiple platforms such as Google Photos, Gmail and other applications that associated with Google account. Like Samsung Cloud, you can back up your Samsung phone to Google cloud. Please go to Settings > Accounts > Google > tap on your Email address, then you can see a list of file types that you can back up to Google account. Please tick the boxes next to the files, then click the three dots button and tap on Sync now. Samsung Messages Backup is an easy & professional Samsung backup software to backup Android files to PC. You can use it to backup your whole Samsung phone to computer with one click. It works really effectively for those who want to transfer hundreds of files to computer at a time. You can transfer files selectively or completely as you like. 1. Support contacts, text messages, call logs, apps, photos, videos, music and so on. 4. Delete/ import music, videos and pictures in batches on computer. 6. Support thousands of devices: Samsung Galaxy S10+/ S10/ S9+/ S9/ Galaxy Note9/ Note8/ Galaxy A9/ A8/ A7/ A6 and more. Have a quick look about how to use it, if you like to search detailed info, you can click the links to learn more. Let us go on. You need to download and run the software on computer at first. Then, connect Samsung Galaxy to PC via USB cable and enable USB debugging if prompted. Please go to Super Toolkit > Backup > select local folder to save the data > tap on Back Up. Please go to the folder (on the left panel) that contains the files you like to backup > select files that you want to backup to computer > click Export > choose local folder to save the data. 1. Be in-built on Samsung phones. 2. With 15 GB free storage. 3. Auto backup once every 24 hours. 4. Data will keep on cloud safely. 1. Limit upload file size (less than 1 GB). 2. Must keep connected to stable network till data transferring process is completed. 3. The upload speed depends on the network. 4. Samsung account is not widely used as Google account. 1. Backup files to PC, Micro SD card or USB disks. 2. Be in-built on some Samsung devices. 3. The mobile app is free on Google Play. 4. Work smoothly on Samsung devices. 1. May not work perfectly on other Android phones. 2. Can not access backups anywhere. 1. Support multiple platforms that associated with Google account. 2. 15 GB free storage. 4. Data will not be leaked out or lost easily in cloud. 5. Widely used on Android devices. 1. The upload speed depends on the network. 2. Need to pay for extra storage. 3. Can not work without networks. 1. Backup almost all kinds of files to PC. 2. Be friendly to wide range of Android brands. 3. Stable data transferring via USB cable. 4. 100% safe & clean. 5. Do not depend on networks. 6. No limit on file size. 1. Can not access backups anywhere. 2. The full version is not free. To keep the backed up data safely, we always select cloud, external memory and computer as the target storage. The Samsung backup apps mentioned above use cloud, Micro SD card and USB memory to save Samsung backups. And we recommend Samsung Messages Backup to backup Samsung to computer. You can select one as you need to back up your Samsung phone. But Samsung Messages Backup is designed not only for Android backup & restore, but also as an all-round Android data manager, which is worth to try.